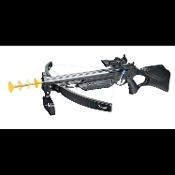 Realistic Life Size Crossbow with Stock Faux Toy Weapon with sight, trigger grip and front end handle attached. Suction tip arrows included. This super cool plastic prop fake bow accessory will accent any zombie, vampire or werewolf hunter cosplay costume. Approximately 28-inches long, 26-inches wide fully assembled, and 8.5-inch tall (70x21.25cm). *Warning: Not a child’s toy.